Taking the form of a mountain of books on the town's market square, Spijkenisse’s new library is both an advertisement and an invitation for reading. Stacking the building's various functions produces its pyramidal form, which in turn is wrapped in 480 meters of bookshelves and reading spaces. The building serves as a benchmark for sustainable technologies. The adjacent Library Quarter consisting of 42 social housing units, parking and public spaces was also designed by MVRDV. Book Mountain is a monument to the power and pleasure of reading. Its visibility and inviting presence is significant in a community with a 10 percent illiteracy rate. Located in the centre of Spijkenisse, the 9.300m2 library takes pride of place on the market square, facing the historic village church from which it appears as a vast mountain of books – Spijkenisse’s Book Mountain. In addition to the library, the building houses an environmental education centre, a chess club, an auditorium, meeting rooms, commercial offices and retail space. The pitched roof references traditional Dutch farmhouses, a reminder of the town’s agricultural heritage erased by 40 years of expansion. To accommodate the additional functions required, commercial space and parking form the podium upon which the pyramid is built. 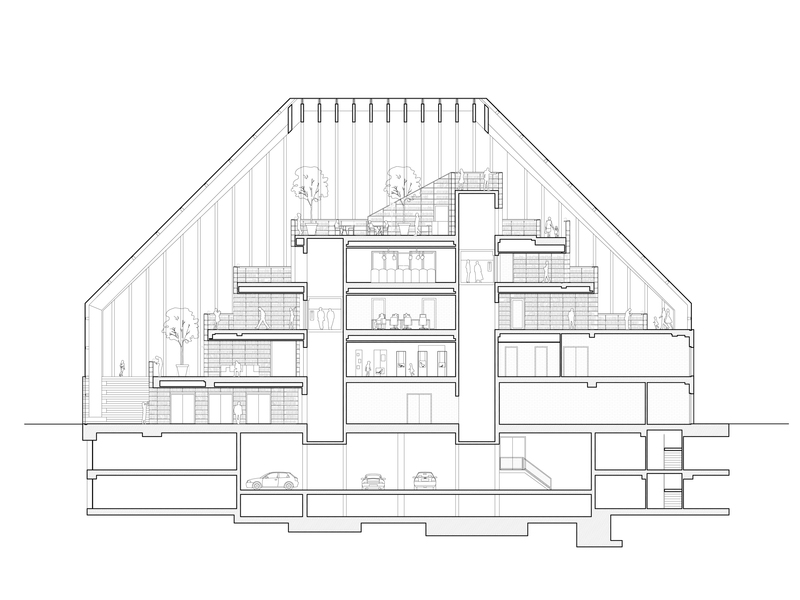 More specialised areas such as the auditorium and seminar rooms comprise the tiers of the pyramid, with the library areas occupying terraces above taking full advantage of the light and volume provided by the glass roof. The book platforms are connected by wide flights of stairs that form a continuous route around the mountain and culminate at its peak where a café offers panoramic views over the Spijkenisse. In order to embed the building within its historical context and distinguish between commercial and public programmes a ‘blanket’ of brick is laid over the neighbourhood and the library’s pyramidal heart, covering floors, ceilings and doors. Above this, the public realm extends to the top of the mountain. Bookshelves that are out of reach distinguish, and literally divide, the library’s archive and borrowing collections. The library’s bookshelves, made from recycled flowerpots, are another nod to Spijkenisse’s agricultural past. The shelves are sustainable, affordable and even fireproof. They provide a functional background for the books by forming banisters, parapets, information desk and bar. They constitute another element in the building’s palette of recycled materials: brick, wood and glass. Sophisticated heating and cooling systems further distinguish the library as a benchmark for sustainable design. The Library is open until at least 16:00 every day, with a free tour at 14:30 on Thursdays. For those taking a car, there is parking underneath the adjacent Library Quarter.